This is an agreement used when renting equipment to a customer. money on your product to spending money designing a professional-looking resume. You get the money back so quickly that it’s actually a much more expensive decision to decide NOT to buy." This Equipment Rental Agreement is included in editable Word format that can be customized in Word or by using the included Wizard software. RENTAL EQUIPMENT / PERIOD DATE TIME RATE Unit(s): Notes: Pickup: Return: Unit(s): Notes: Pickup: Return: TOTAL: $0. Company agrees to rent the above-named equipment to renter at a total per-day rate of, plus a refundable deposit. Renter agrees to pay all rental fees, including deposit prior to taking possession of the equipment. For the purpose of this Agreement, a rental period shall be any 24-hour period from the time this Agreement is signed, regardless of when Renter takes physical possession of the equipment. Renter agrees to return the equipment before or by the return times listed above. Renter agrees that if equipment is returned later than (minutes/hours) after the time specified above, an additional day's rental shall apply. Renter agrees to be financially responsible for all theft or damage that may occur to the equipment. In the event of theft or damage, Renter's damage deposit shall be credited towards any replacement cost or repair to the equipment. Failure to compensate Company for theft or damage to the equipment upon failure to return the equipment in the same working condition as it left shall constitute a breach of this Agreement. In the event of such a breach, Company has the right, but is not obligated, to pursue any or all of the following remedies: (1) terminate the Agreement, (2) recover Rented Equipment, whether in the possession of Renter or not, (3) bring legal action. Company warrants the equipment is in good working order. All equipment shall be tested in front of Renter prior to Renter taking possession of the equipment. If the equipment does not conform to the normal operating specifications (defined as the typical usage of the rented equipment without regard for a specific usage Renter may have intended for it), the Company shall be responsible for correcting the defect; replacing the equipment or refunding the rental fee without unreasonable delay, at Company's sole expense and without charge to Renter. This warranty shall be the exclusive warranty available to Renter. Renter waives any other warranty, express or implied. Renter acknowledges that Company does not warrant that the equipment will work on all platforms or under any application that Renter may intend to use the equipment for. Renter acknowledges that Company is not responsible for the results obtained by Renter. Renter waives any claim for damages, direct or indirect, and agrees that its sole and exclusive remedy for damages (either in contract or tort) is the return of the consideration paid to Company. This Agreement shall be binding upon and inure to the benefit of Renter and Company and their respective successors and assigns, provided that Company may not assign any of its obligations under this Agreement without prior written consent of Renter. The above prices, specifications and conditions are hereby accepted. The Company is authorized to execute the equipment rental agreement as outlined in this Agreement. Payment will be made as proposed above. 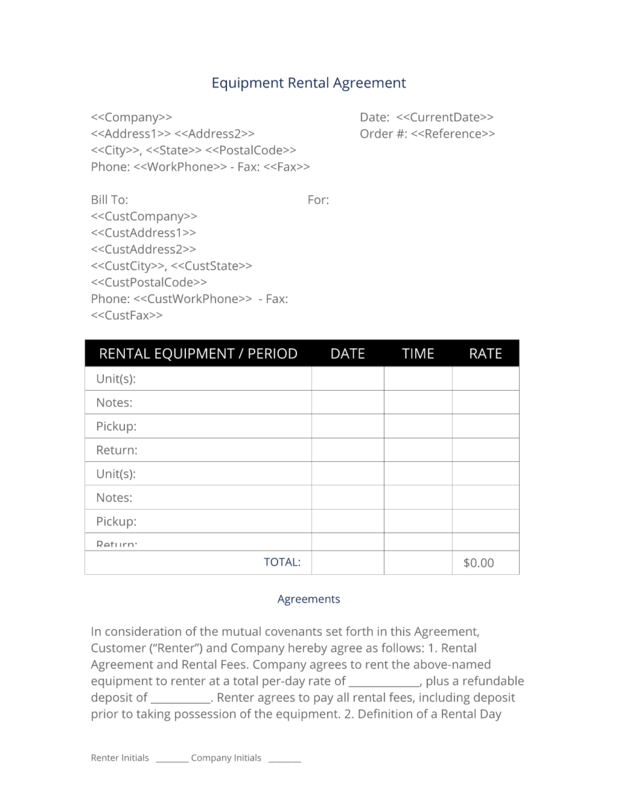 The complete Equipment Rental Agreement - with the actual formatting and layout - is available in this Contract Pack.